Free .net report generator Excel or OpenOffice. This video shows how easy to create template and get your report using MonoReport. Currently MonoReport supports Microsoft Excel 2003, 2007 and OpenOffice (from MonoReport 1.2 version). 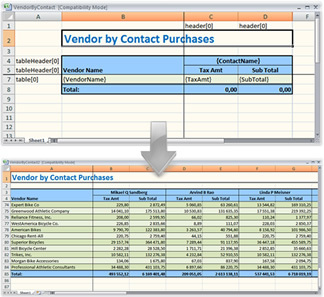 Samples for Excel and OpenOffice are available in the FREE version. Please, let us know if you need MonoReport to support other spreadsheet editors. MonoReport is a report generator developed on .NET platform (C#). MonoReport works with .Net Framework 2.0 or higher (Mono framework will be supported soon). MonoReport redistributable run-time is royalty-free libraries. So MonoReport could be used in any environments that can use .NET Framework libraries. Fogsoft has been developing eProcurement Management Systems, Supplier Relationship Management (SRM), project management systems and innovation environment support systems since 2005. We create software that works better than it was intended. Fogsoft started out in 2005 and the company has completed over 100 medium and large-scale projects with the implementation timeframe ranging from 3 months to 4 years. We have completed all of our projects successfully. When we develop custom products our approach is to give more than was initially planned. Our company has 10 years experience of custom software development. Our experts help you to make an informed decision, which is the most fully meet your business needs. In new version fixed minor issues, fixed problems of free version with processing of Microsoft Excel templates. Now free version does not contains banner on the top of generated report. MonoReport is a free .NET library that enables your application to generate spreadsheet reports using Microsoft Excel 2003, 2007 and OpenOffice. Free edition of MonoReport is available for download. Free edition produces fully-functional reports that contain small link to our site on the top and are protected (cannot be modified).